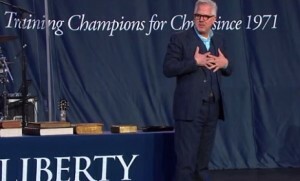 LYNCHBURG, Va. — Liberty University and its president, Jerry Falwell Jr., recently invited Glenn Beck to take center stage to address thousands of students during its annual convocation ceremony, whose speech included references to Joseph Smith and Mormon theology. Beck then took the podium to applause and cheers, explaining on a lighthearted note that he ran into Falwell at Billy Graham’s birthday party earlier this year. He then fought tears as he told the audience that he believed he was given a message from God that day to share with the students. Liberty University, which is considered to be the nation’s largest Christian university and whose motto is “Training Champions for Christ” has been under fire for continuing to drift from biblical Christianity. As previously reported, concerns were expressed last month after the university minimized objections to the utilization of a homosexual advocate to teach students choreography in its presentation of Mary Poppins. Many also expressed disagreement when Brandon Ambrosino, a Liberty student that came out as an open homosexual on campus, was allowed to enroll as a graduate student in Liberty’s seminary program.